Saurabh comes with a rich experience of over seven years in the field of healthcare consulting, hospital operations and corporate strategy. At Medium he has worked on large engagements for leading medical technology and pharmaceutical companies on possibilities of integrating offerings in critical care areas, development of new products, the voice of customers and leading market research projects on existing products to help grow their product portfolios. He has also developed business plans for new business houses and lead performance transformation projects for large hospitals. Prior to joining Medium, Saurabh worked with the corporate team of Care Hospitals, one of the top hospital chains in India. He was associated with their strategic alliances and new initiatives streams. As a key member of the corporate initiatives team, he has been credited with planning the Liver Transplant Program across the group hospitals. He has extensive experience in blueprinting, operationalizing and commissioning of new hospitals for the group. Other areas where he has worked include exploring new avenues to drive both vertical and horizontal expansion for the group. He was also a key member for a hospital group based out of Lucknow, where he was heading operations for their diagnostics and wellness chain along with setting up a 300-bed hospital. 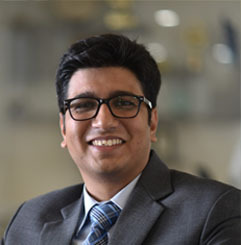 Saurabh completed his MBA from Symbiosis International University, specializing in Hospitals and Healthcare, and before that, he had completed his Bachelor’s in technology in Bioinformatics from Jaypee University of Information Technology, Solan.